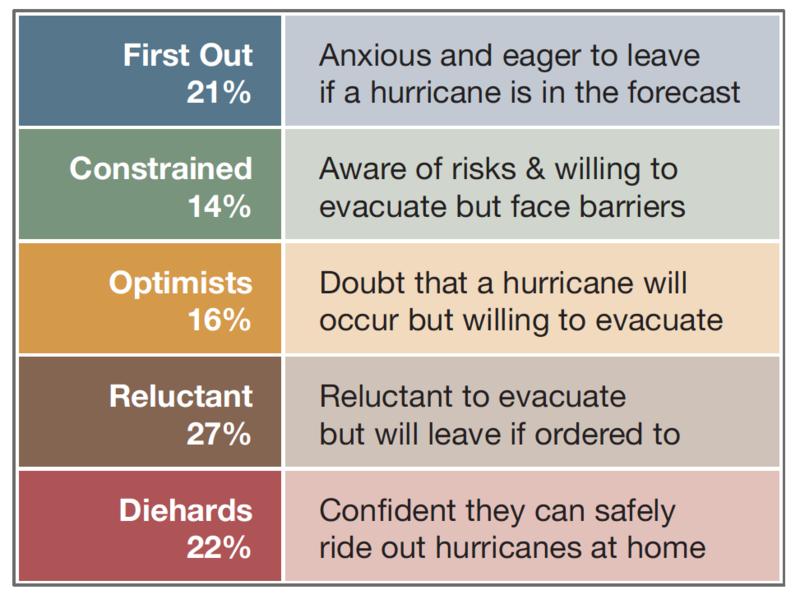 Taken from “Hurricane Attitudes of Coastal Connecticut Residents: A Segmentation Analysis.” The audience analysis resulted in five unique segments: 1) the First Out; 2) the Constrained; 3) the Optimists; 4) the Reluctant; and 5) the Diehards. A short summary of each segment is provided , and brief descriptions of each group’s characteristics and tendencies follow. Marlon, J.R., Rosenthal, S., Feinberg, G., Pal, S. and Leiserowitz, A. (2015). Hurricane Attitudes of Coastal Connecticut Residents: A Segmentation Analysis. June 29, 2015. Yale University. New Haven, CT: Yale Project on Climate Change Communication.